Full name: Georg Moritz Hagen Listing. Nickname: When the boys want to pick on him, they call him “Moritz” or “Hagen”. Date of Birth: March 31, 1987. Place of Birth: Halle, Germany. Brothers/Sisters: He’s an only child. Father: Like Bill and Tom, Georg’s parents are divorced. His father is a dentist and doesn’t have a very good relationship with his son. 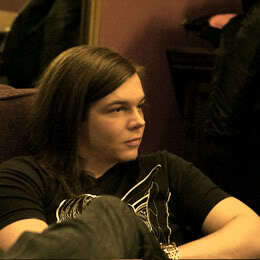 Georg doesn’t like talking about it either. School: Graduated from the German form of senior high. Favorite Subject in School: Psychology. Hated Subjects in School: Math and German. Hobbies: Music and once in awhile sports. Favorite Music: Fall out boy, Billy Talent and Yellowcard. Personality: Georg and Tom are more alike when it comes to hitting on girls. He also enjoys showing his body off when on stage and usually strips his shirt off. Georg is also teased a lot from the twins due to his clumsiness. He also likes sleeping naked. I'd let him teach me how to play the bass!!! 1. Hide his hair straightener. 2. Jump out of a random closet, scream as you shove a rock in his mouth and walk away as though nothing has happened. 3. Constantly remind him that he spends more time on his hair than the average American girl. 4. Creep up behind him the middle of the night singing The Itsy Bitsy Spider. 5. Paint his guitar bright pink with a yellow lightening stripe. 6. Draw a mustache on his face in permanent marker while he sleeps. 7. Laugh hysterically when he wakes up to discover your lovely artwork. 8. Lean very close to his face, until your noses are almost touching, and loudly declare Im wearing new socks today! 9. Spend all of your free time thinking up ways to annoy him. 10. Light a match, CAREFULLY hold it close to his hair and say This is a hold up, nobody move and Georg's hair doesn't pay the ultimate price! 11. Ask if he would like a kiwi. 12. Yell and refuse to speak to him for the rest of the day if he says no. 13. Put a cheeseburger under his pillow. For no reason at all. 14. Scream and cram a fistful of gummy bears in your mouth every time he speaks the word stage. 15. Talk gangster all the time. 16. Pour ranch dressing down his back and ask if hed like fries with that. 17. Stand in the corner of his room with shoulders straight, chest out, chin up, eyes wide, and a wooden spoon in your hand. 18. Mess up his hair. 19. Graffiti Toms room to the extreme. When he angrily demands to know who did it, plaster an innocent look on your face and point to Georg. 20. Grin as Tom chews Georg out about the graffiti-ed bedroom. 21. Ask for guitar lessons. While hes teaching you how to play accidentally break every single string. 22. Put one of those headbands with the bunny ears on them on your head and walk in his shadow the rest of the day. 23. Tell him hed look great in pink. 24. Point out that if you squint really hard he vaguely resembles a bison. 25. Ask if hes related to Arnold Schwarzenegger. 26. Follow him around with a jar of I Cant Believe its Not Butter and loudly point out to a random passerby that Chuck Norris CAN believe its not butter! with wide, amazed eyes. 27. Dance in circles around him with a lampshade on your head. 28. Jump up and down and urgently say I need tacos! I need them or I will explode! 29. Give him pink frilly girly outfits for Christmas. 30. Hide all of his beloved hair care products. Oooooh! I am so happy he plays WoW! HE'S MAH HOMIENERD!!!! Georg looked like a warrior. He had the same mount as me! So he could be a Night Elf lvl 70 warrior. xD lol I AM A NEEEEEEEEERD!! !